It’s 5:30 am when the alarm goes off in our hotel room. It’s pitch dark and a brisk fifty-two degrees outside as we get dressed and go downstairs for a quick breakfast before heading out for our 6:15 appointment. 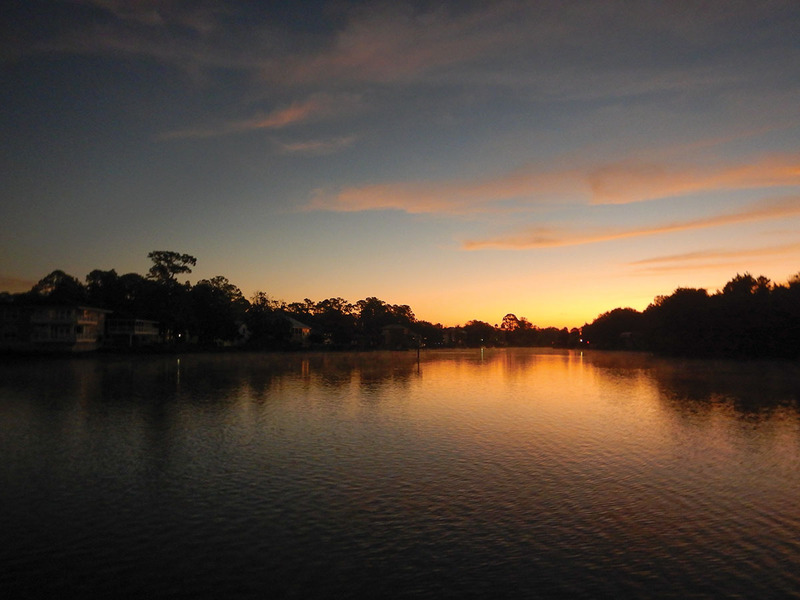 We had made the nine hour drive from Jackson to Crystal River the day before as a fun side trip from our Orlando theme park vacation. 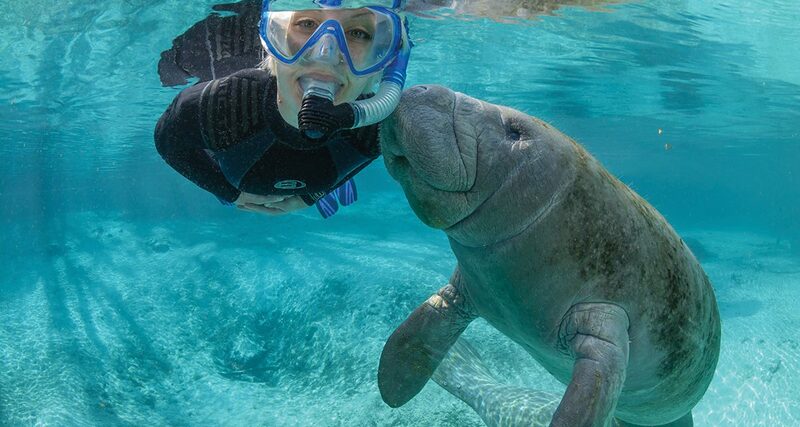 While researching our trip online, we stumbled upon some tourism information that mentioned manatees are most easily seen in the cool, winter months when they congregate in the warm, spring-fed waters of the Crystal, Homosassa, and Chassahowitzka rivers of northwest Florida. 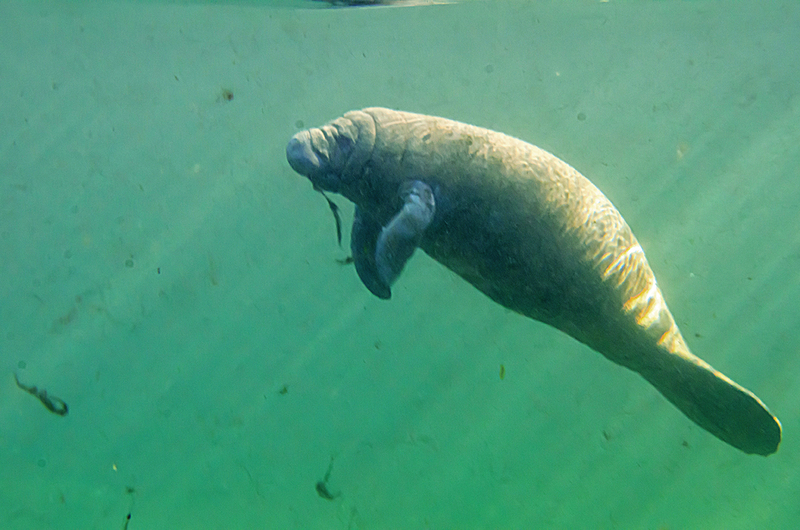 The promise of having a first-hand manatee encounter was too much to pass up. It’s just a five-minute drive to our destination and we’re the first group to pull into a parking spot at River Ventures. The building is painted in bright blue and aqua paint complete with a manatee face hole board for family photos and a large, gray fiberglass manatee in front of the shop. We enter the building to the greetings of the staff as they check us in and show us to the education room where we are briefed on safety aboard the boat and in the water. Then, Gloria, the center’s educational advisor, queues up a video that explains how to respectfully and lawfully swim with manatees that includes open-hand touching and passive observation. 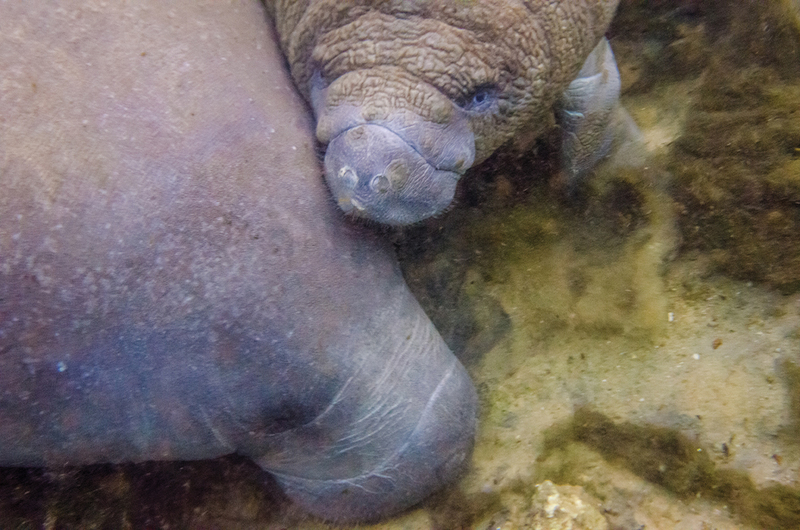 It turns out, manatees can be very inquisitive and sometimes playful during swimming encounters. 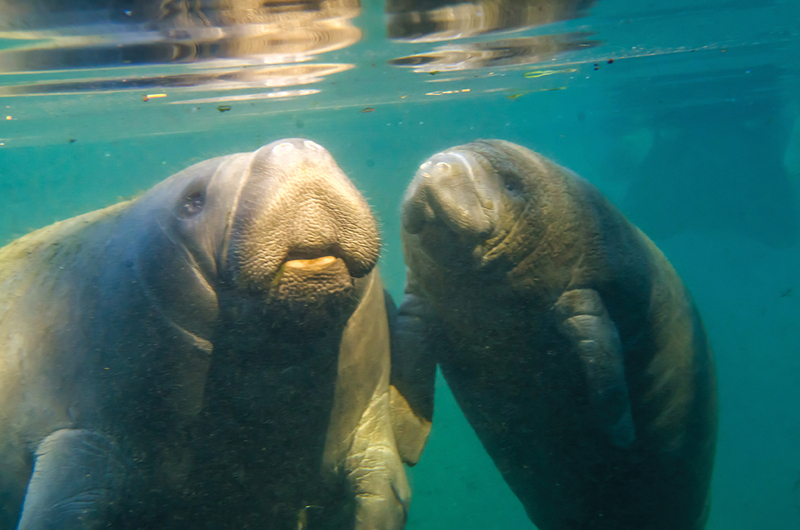 Once an endangered species, conservation efforts and protective laws have helped increase the numbers of West Indian manatee in Florida, but the beloved sea cow, as they are often called, still remains on the threatened species list due to habitat loss from waterfront development, fishing nets, motor boat collisions, red tide, and also their slow reproduction. For this reason, tour operators in the area are very sensitive about protecting the wellbeing of these docile mammals. After the brief education video, the staff begins fitting our group with wet-suits and snorkeling masks before we bag up our other gear and board the tour bus for a five-minute drive to the marina nearby. After exiting the bus, we are introduced to our tour team of John Baltzell and Crystal Diodati. Captain Baltzell, otherwise know as ‘Johnny B’ by the regulars, has been an expert eco-tour captain for 19 years. Before we pull away from the dock in our pontoon boat, he goes over the safety features of the vessel, the equipment we’ll be using, and what we should expect to see while snorkeling. As we began our easy tour of Kings Bay, Captain Baltzell tells us about the various native wildlife of the bay while he and Crystal pass around the hot chocolate to keep us warm. Our in-water guide, Crystal, also dressed in a wet-suit, takes questions about the area waters and the manatees we are about to meet as she scans the horizon looking for signs of the gentle creatures. Having earned the moniker of ‘Captivating Crystal’ by her co-workers due to her ‘manatee whispering’ skills, she tells us about the affection and curiosity some of the manatees might display with our group. Crystal tells us we are headed to spot where manatees were congregating the day before as she begins snapping pictures of the group and the bay as our official River Ventures documentarian. After about 15 minutes, the sun rises far enough above the horizon to illuminate the beautiful, clear spring water of the bay. We’re able to see the sandy bottom 11 feet below the boat, rich with patches of sea grass, algae, and the occasional snook swimming by. Then, Crystal spots our first manatee ahead of the boat. 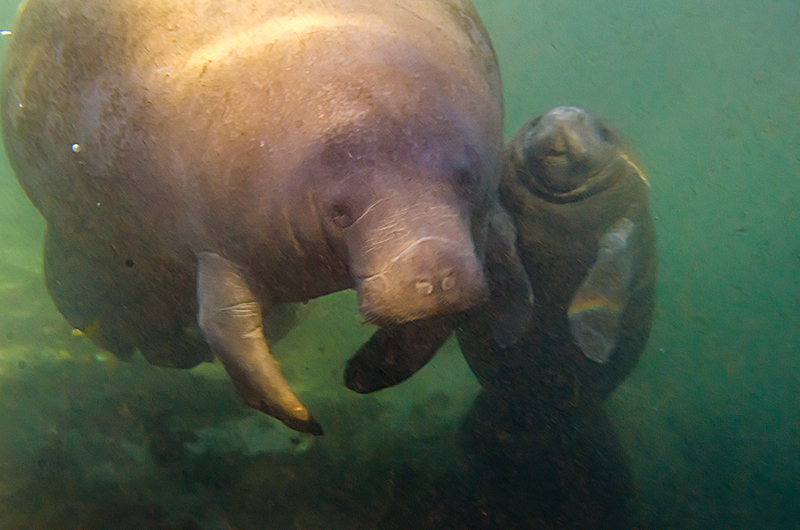 As John slows the engine and steers around the manatee, we are finally able to see just how big they are. At 10-13 feet in length and weighing up to 1,300 pounds, adult manatees are surprisingly large up close. John informs us that we’re nearly to our snorkeling location and asks us to prepare our masks to make sure they seal around our faces and prepare any camera equipment we plan to use in the water. Once the boat comes to a stop and we drop anchor, Crystal gets in the water to assist the group as we slip into the water one-by-one from the latter at the back of the boat with a foam noodle under our waist to keep us on top of the water. John and Crystal assist everyone to ensure masks are secure and all are comfortable in the water before we begin our search. Then, Crystal demonstrates the proper way to swim, using a dog paddle motion with our hands and not using our feet. Floating silently on the surface of the crystal clear lagoon, mask submerged, we begin scanning for signs of manatee activity. After a couple of snook swim by, a small group of adults and calves begin to come into focus in the distance. They are dining on a patch of sea grass in between trips to the surface for a breath of air every few minutes. A couple of young adults separate from their group and begin performing somersaults as they gently nudge a couple of swimmers from our tour. They are large animals with tiny, dark eyes, flippers, a circular tail, and a large bulbous snout covered with whiskers that conceals their molars. The manatee’s gray skin is covered in a thin layer of algae that is shed seasonally as they move between fresh spring water and the salty coastal waters they inhabit in the summer. They are very graceful swimmers, and while they usually move slowly through the water, manatees are actually capable of powerful bursts of speed using their large tails. The calves stay right beside their mothers as they move between the surface and the lagoon’s bottom. Manatees are related to elephants, not dolphins or whales. A manatee can eat a tenth of its own weight in just 24 hours. 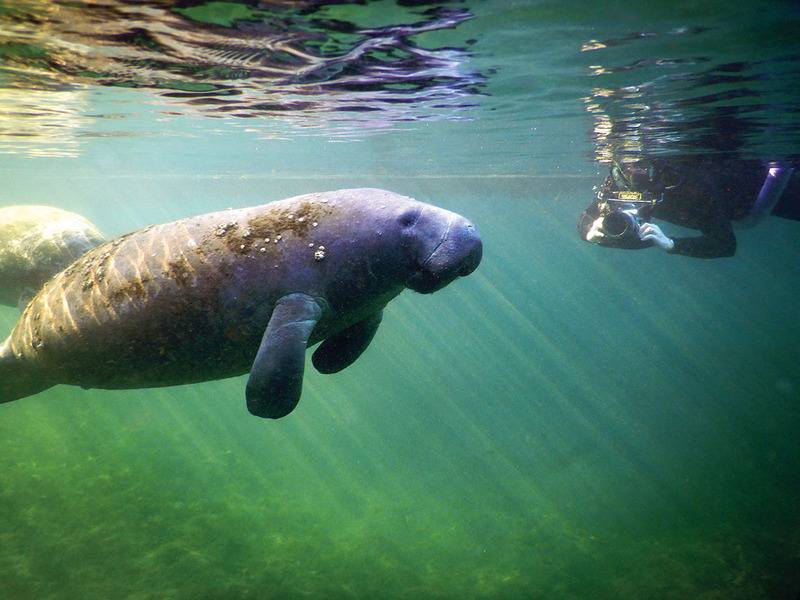 Manatees are considered slow swimmers, but they can swim 15 miles per hour in short bursts. Manatees can live up to 40 years in the wild. There are two other species of manatee which inhabit the Amazon River and the west coast of Africa. 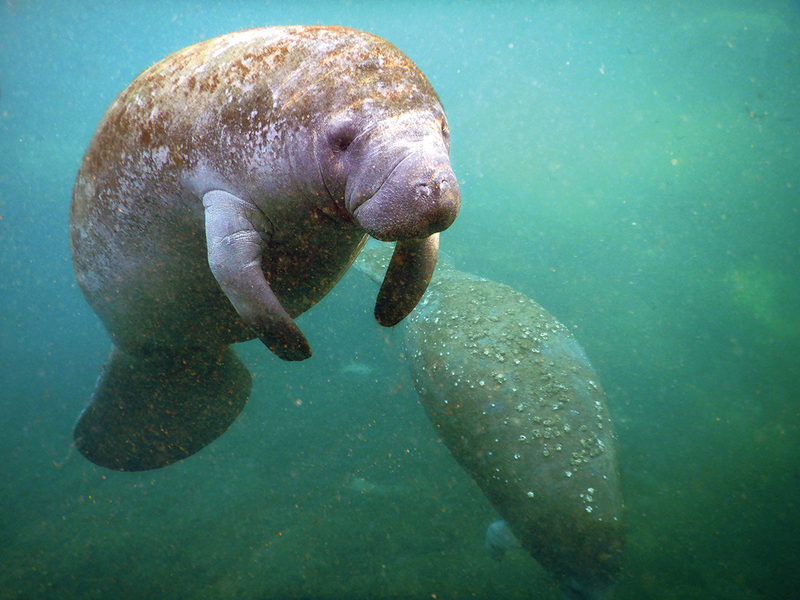 A West Indian manatee can weigh more than 1,200 pounds. 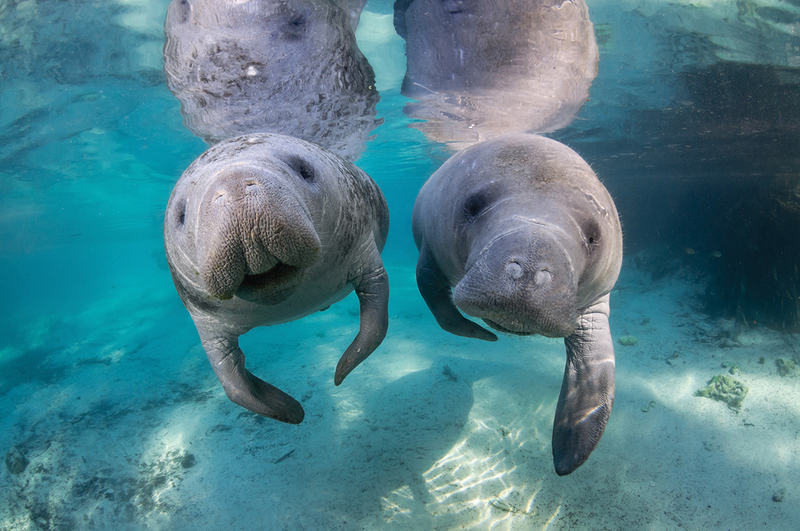 Florida manatees congregate at power plant discharge pipes, where the water is warm. Manatees are thought to have evolved from four-legged land mammals more than 60 million years ago. 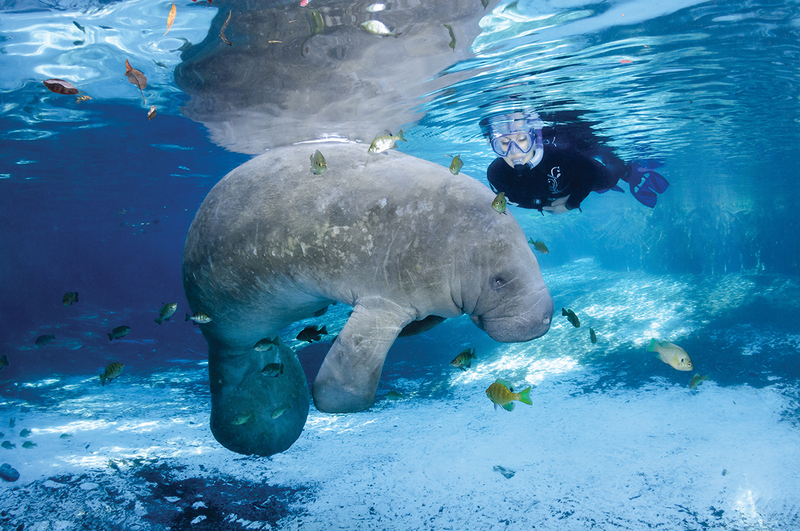 The opportunity to swim with these gentle giants proved to be a one-of-a-kind experience we’ll never forget. 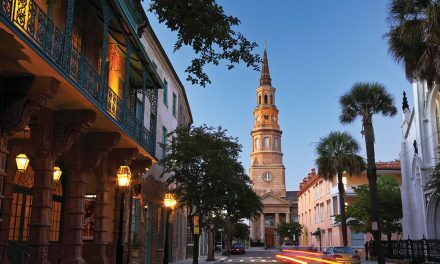 The relaxing experience was the perfect lead into the more demanding vacation experience of the Orlando theme parks. I highly recommend taking the extra day to check out Crystal River during your next Florida trip. River Ventures also offers scalloping tours where you can hunt for your own scallops in addition to paddle board and air boat tours.